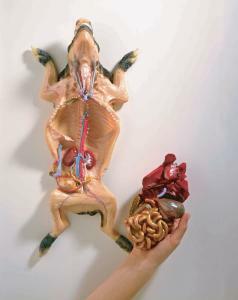 Cast from an actual specimen, all of the intricate structural detail usually only seen on a real dissected specimen can clearly be seen on the model of a nearly full-term fetal pig. It features all internal organs and major arteries and veins found along the body cavity, head, and neck. In addition, the heart, lungs, stomach, liver, and intestines are removable as a single unit so students can study the deeper organs and vasculature. One kidney is sectioned to show renal circulation. Made of a unique material for flexibility and durability, the model has the look and feel of a real specimen, and is hand painted to match real dissection specimens.